Radar scope presentation with and without MTI. Radar in which the Doppler effect can be employed to differentiate between stationary and moving targets, with the former suppressed and only the latter displayed. In this process, the permanent echoes as well as those from very slow moving objects (if desired) are not displayed on the PPI (plan position indicator), and the radar controller can pay attention to the real aircraft. GEOINT Training now consists of an IMINT section working in an integrated and collaborative Analysis and Control Element (ACE) environment where students simultaneously exploit FMV and MTI radar returns, cross-cue multiple sensors such as Unmanned Aerial Systems (UAS) and the Joint Surveillance and Target Attack Radar System (J-STARS), and produce digital reports including Imagery Derived Products (IDP) and video clips within the DCGS-A concept design. Performing complex MTI radar missions from space poses many technology challenges. No other collection asset provided the wide-area all-weather coverage of the battlespace that the [Joint] STARS did with the [moving target indicator] MTI radar. The first of four Horizon helicopters -- Eurocopter AS 532 Cougar helicopters fitted with MTI radar -- was declared operational on March 1, but as the program was launched in the '90s, many of the components of the system are considered obsolete. Other topics include imaging radar, pulse-Doppler and MTI radar, and special radars such as weather radar and ground-penetrating radar. Like the MTI radar, the SAR measures returned signal power at time increments equal to the pulse width to create a series of "range bins," which determine the radar return as a function of distance from the radar, as shown in Figure 2. The Thales Target MTI radar was successfully operated on a Super Puma helicopter during the 1991 Gulf War, and is now used on four Cougars employed by the French Army. For example, an MTI radar with pulse repetition frequency of 6,250, which samples 200 times per pulse and digitizes the I&Q values at 12 bits each, generates 30 Mbits per second of raw data. 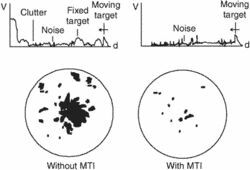 Since an MTI radar uses Doppler frequency shifts to separate small moving targets from fixed clutter, the phase coherency between the transmitted signal and the downconverted received signal is of extreme importance. The background experience for Sostar includes the Thales Target MTI radar used in the French Army Horizon system and the Fiar Creso radar tested on an AB-412. The use of this standard is expanded to include the RCS calibration of any moving vehicle that might be used in evaluating the capabilities of an airborne MTI radar system. The MTI radar sensor is quoted as having a detection range of at least 100 km and four operating modes: "Acquisition" (target detection/localization), "Count" (high-resolution analysis of a particular sector), "Memory" (overlay facility for analysis of activity over time) and "Expansion" (digital display enlargement).